Supported by Book Dash facilitators, editors, and lots of food and coffee, these incredible volunteers manage to complete a process that would usually take months. The best part? 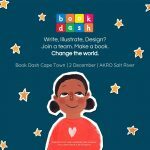 Everything created on the day is their gift to the world, and all the books produced can be read right here at bookdash.org. All the stories can also be downloaded, adapted, printed and shared in any way. Just remember to credit the creators, and link back to this site. A huge thanks to the Chris Otto Foundation for sponsoring this wonderful event. You can see photos from the event on our Facebook page below.